This vanity is a great way to add modern style to your bathroom. Its beautiful white marble counter and brown solid wood base bring a great new look into your bathroom. Its drawers and roomy double-door cabinet are great to keep bathroom items in. Add a classic feel to your bathroom with this simple vanity set from Wyndham Collection. 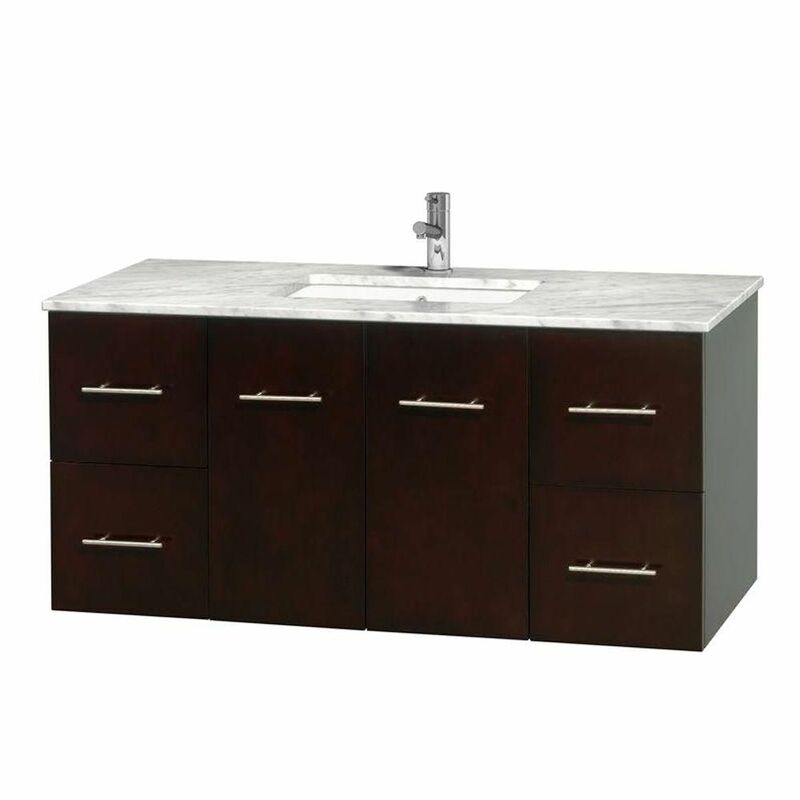 Centra 48-inch W 4-Drawer 2-Door Wall Mounted Vanity in Brown With Marble Top in White This vanity is a great way to add modern style to your bathroom. Its beautiful white marble counter and brown solid wood base bring a great new look into your bathroom. Its drawers and roomy double-door cabinet are great to keep bathroom items in. Add a classic feel to your bathroom with this simple vanity set from Wyndham Collection. Centra 48-inch W 4-Drawer 2-Door Wall Mounted Vanity in Brown With Marble Top in White is rated 4.0 out of 5 by 1. Rated 4 out of 5 by jose from Beautiful vanity there were some minor problems that my worker had to take care of. Some drawers needed to be realigned etc.. But all in all very pleased with the marble and finish. We have finally finished the bathroom and have been using it for a few weeks. Friends are impressed etc.. I never give anything 5 stars, so take that into account when you see my 4 star review. Note we also used the home depot's black/white 6"x3" marble for the surround of the mirror and shower.